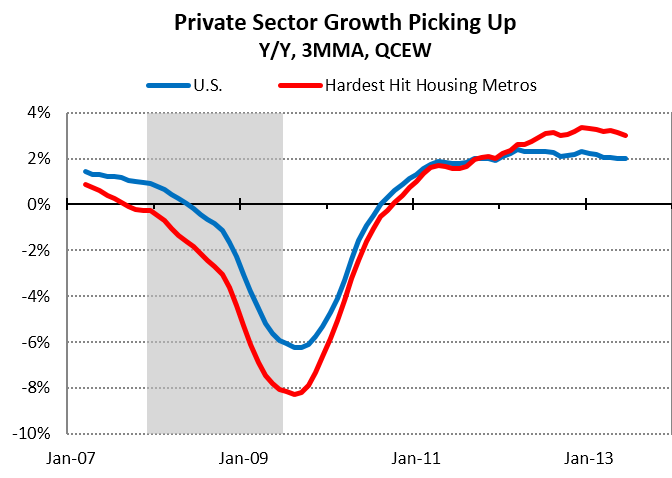 The housing recovery has clearly stalled out in the past 6 months or so. Permits, starts and sales have all leveled off– or worse. The most likely culprits are the continued strong home price appreciation coupled with the run-up in mortgage rates making financing more difficult as would-be buyers experienced sticker shock. The bad weather has certainly not helped either but only impacts the past couple of months. 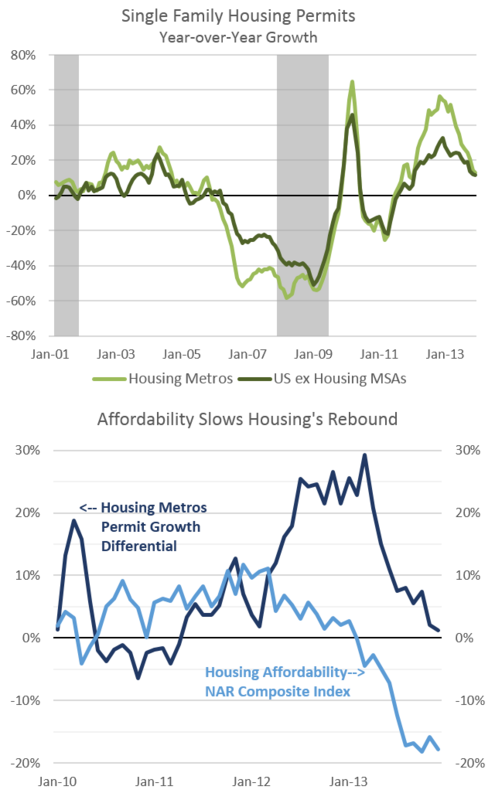 While in the big picture, as Calculated Risk notes this slowdown is expected to prove temporary, it has clear economic implications, in particular at the regional level in the hardest hit housing metropolitan areas. 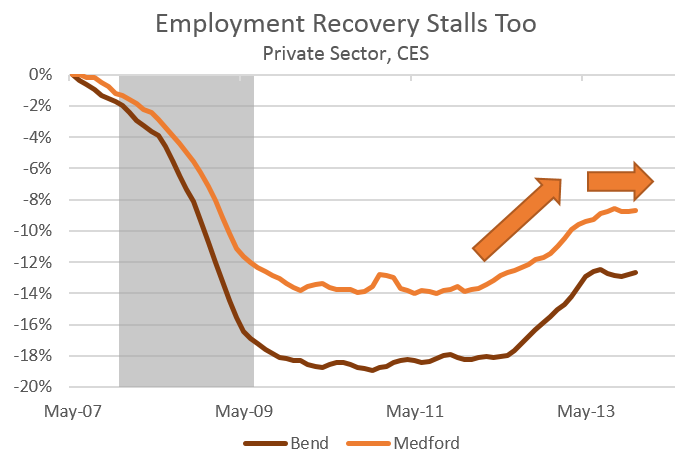 The 50 worst housing bust metros were rebounding faster than average so far in recovery — including Bend and Medford here in Oregon — but we only have good data at the local level through last June, when things were still rosy. In terms of housing activity, new permits were growing fastest in these same metros up until last summer when permits decelerated more quickly than the nation overall. Sure, permits can be more noisy but they do eventually translate into actual new construction and economic activity, which is fundamentally what we care about. This slowdown is likely the byproduct of rapidly declining affordability and is more pronounced in the 50 worst housing metros. Not coincidentally, the bulk of these metros are in the West, where recent information from Toll Brothers says they saw the largest declines. To the extent that construction and related activity falters, and slows down economic growth, that’s when it becomes a much bigger concern. Just as the return of housing boosted our regional economies in 2012 and early 2013, the housing stall has effectively stopped these local recoveries . 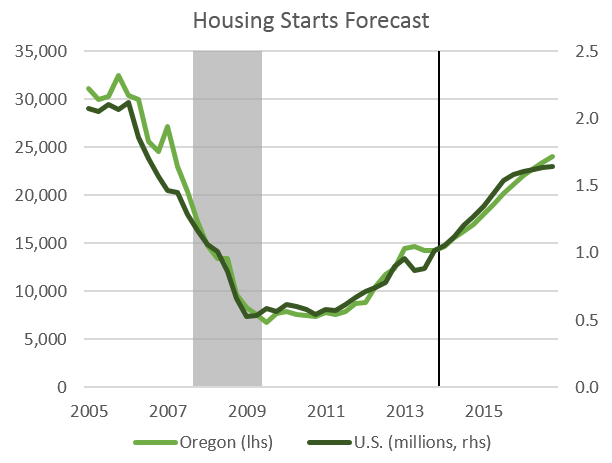 Should this pattern replicated across the country — at it likely is — and the housing stall persists, it will weigh on the economic outlook provided one pillar of growth in the next few years is a strong housing recovery. 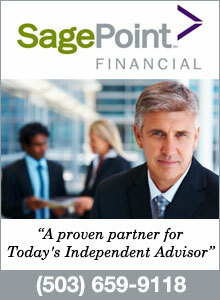 Thankfully, in the big picture this slowdown is likely to prove temporary. The market should settle as buyers become accustomed to higher interest rates — which should also slow price gains, holding affordability somewhat steady — and increased demand resumes from both a stronger economy (more jobs and income) and a pickup in household formation as demographics are in our favor. The biggest takeaway here is that while our office has long been talking about rural and regional economic recoveries as housing and government turnaround — and we’re certainly seeing that — there are still downside risks involved. The housing recovery should still be multi-year in nature, but there has clearly been at least one hiccup so far and maybe more bumps along the way. Given that the Oregon Employment Department does quarterly benchmarking, this data is more trustworthy. Once BLS revises all metro data in March, many of the housing metros are likely to follow a somewhat similar path. I wonder if the old Blue State Red State environment has anything to do with the dilemma? I doubt we will see those statistics.